Kyle Lafferty returned to horsing around at training on Friday before declaring himself fit for Northern Ireland’s Euro 2016 opener with Poland in Nice tomorrow. The 28-year-old striker brushed off any concerns over the groin problem which forced him to the sidelines on Tuesday by rejoining Michael O’Neill’s group three days later and was in high spirits. During a resistance-band training exercise, he mimicked a horse at the Saint-Georges-de-Reneins training base, much to the amusement of his colleagues, and then insisted that, despite scaring himself earlier in the week, he would be fine for the Polish test lying in wait on the French Riviera. In an interview with the Irish Football Association, he said: “It’s feeling good, I trained by myself yesterday, did a few runs, a few twists and turns and it feels good. “Seeing the way I fell, the way I landed, I thought the worst, but I came through it and got the scan results which were all clear and I’ve never felt better. “When I had the sharpest pain in my groin, I thought the worst, as you do, but the longer the day went on, I started feeling better as I was getting more stiff and that was probably a good sign. 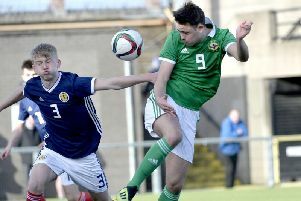 While he has been unwanted by Norwich, his evolution into his country’s leading forward was a huge factor behind Northern Ireland’s successful qualifying campaign, in which Lafferty scored on seven occasions. O’Neill’s role in transforming him from class clown to lethal marksman has been praised by Lafferty himself, although the striker showed on Friday that the joker is a guise he can still adopt in the right situation. “That’s Kyle, he keeps us all entertained,” said defender Gareth McAuley. “He’s not far off making himself the clown, but once we get there and at the stadium he will be fully focused and he knows how important he is to us. He’s a big player in what we’re trying to do. “He’s all right, I think he was like Bambi on ice the other day. He’s gone through it all right - at some stage he slept in the chapel at the hotel the other night!